What Does Self-care Really Mean To Me? Dieting is not about you, it is about meeting other people’s goals, ideals, and values. Diets typically value external information like calories, meal plans, and specific foods, over your own internal cues (hunger and fullness, likes and dislikes). Diets and expensive weight loss gimmicks promise a future outcome such as a new life, more love, or a better job – results that simply can’t come from weight loss. Many corporations and professionals erroneously use the term mindful eating to disguise a diet or restrictive eating message! So, if mindful eating isn’t a diet, why would you want to eat mindfully? To step off the diet, restrictive eating, body hating, train so many people unknowingly climb on to get “healthy.” Listen, life is more than what you weigh. Health is more than a number on a scale. Food is more than nutrients and calories. The larger issue isn’t about weight, size, or appearance, it is about self-care. What is self-care? Or more specifically, what is compassionate self-care? How does a person balance his/her wants and needs in a caring way? What does self-care really mean? On the surface, this seems like a simple question, but dig a little bit deeper than the typical “stop eating [x]” or “Start eating more [y]” it is easy to realize self-care is complex. To start your journey, consider completing the following Thought Compass. The activity, which is excerpted from the Core Concepts of Mindful Eating: Professionals Edition is described below. If you aren’t sure how to explore what self-care is, consider trying the Thought Compass activity – a mini-mind map. You can see in Image 1 a simple circle. In Image 2, place the concept you want to explore in the center. In Image 3, start to think about four points you need to explore. After you decide what to place on the four points, keep expanding these points until you have exhausted your ideas. In this example, I chose Benefits, Barriers, Ideas, and What’s kind. You don’t have to use these points, you can create your own. Take a look at what you have written, and see if there are other connections, or if topics relate. For example, you might identify the “benefit” of self-care is feeling better and you might also decide it is “kind” to take care of yourself. These two concepts are related and connected! If you can, be aware of all the ideas and opinions you have about self-care, which might tend to favor a more results-focused view or effect, but don’t always consider what is “kind” or “compassionate” in a busy life. Keep exploring what self-care really means to you. 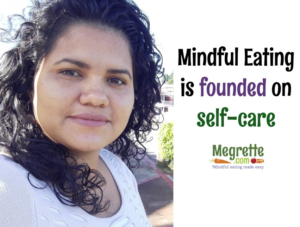 To help you, The Center for Mindful Eating created the Principles of Mindful Eating and the Mindful Eating Position Statements. These statements may not have much value to you, until you really dig into them. To help you consider joining the Mindful Eating Day celebration. It’s free and there you can join The Center’s closed Facebook group to explore the concept of self-care with two amazing internationally known dietitians. Fiona Sutherland is a dietitian in Australia, and founder of Body Positive Australia and Linn Thorstensson is Nutrition Therapist and owner of Straightforward Nutrition in Ireland. Together they have crafted an exploration into compassionate self-care by posting memes and daily discussion topics.